Fleeting Flights presents a major solo exhibition of new work by British artist David Bethell. The exhibition follows the story of a man’s struggle to escape from his own self-induced purgatory. 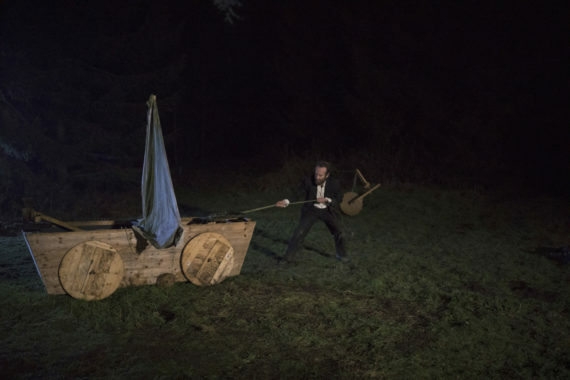 Taking place in an isolated woodland, the story follows the protagonist’s futile attempts to escape his ramshackle shack via a wooden balloon. The exhibition features David Bethell’s debut short film for the first time, co-commissioned by Mark Devereux Projects and HOME Artist Film. As part of this solo gallery presentation, Fleeting Flights includes the many elaborate wooden contraptions designed and built by the artist. Fleeting Flights follows the artist’s interests in imagining and creating functional objects that are tested to their material limits. Many of the sculptural works within the exhibition have been reinterpreted from previous artworks. Recurring throughout Bethell’s practice, undercurrents of folly and humour are often found, helping further establish the sense of futile work. Fleeting Flights is the culmination of an eight-month project (Re-sight), in which the artist undertook intensive artist professional development mentoring with Mark Devereux Projects and external mentors. The final work marks Bethell’s first foray into incorporating short film within his sculptural and performative practice. Re-sight and Fleeting Flights has been supported by Arts Council England and HOME. Fleeting Flights is co-produced and curated by Mark Devereux Projects and HOME, Manchester.